Feb 26 Kasja, a Baby Fig ready to play. 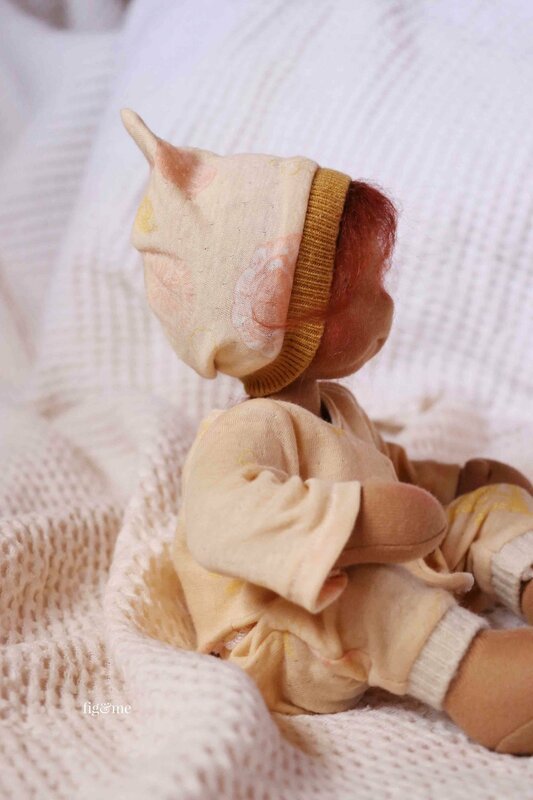 Baby Kasja is an 11" Natural fiber art doll, that comes with a full wardrobe and a wooden crib. Baby Kasja has been so very patient with me. Allowing me to make her clothes and more clothes, even though she had no particular positive feeling for the measuring sessions. Which by the way, I had to bribe her with lots of baby biscuits. But the time has come to find this cute and oh! so cuddly bebe, a home. Yes. She is in search of a good family, a caring mother, doted arms so to speak, where she can land and be taken care of. Kasja is made with my Baby Fig pattern, and stands 11" tall. She is weighted in her torso with glass beads, stuffed with wool, and her hair is made of mohair yarn. Her eyes are embroidered with cotton floss and her rosy glow was obtained with red beeswax. Kasja and her knitted bonnet, by Fig and Me. And because Kasja really brought tears of joy over here, my husband volunteered to send her home with her very own cradle. She travels in style this one. 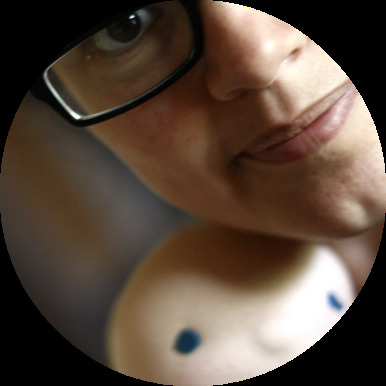 So come on in, so I can tell you more about her spitfire personality and you can check out all her goodies. Baby doll Kasja in her wooden cradle, by Fig and Me. I will, most definitely, take more photos of her cradle because the light did not cooperate and truth be told, we just wanted to play with her outside. Give her a real nice sunshine bath. But at the very least, you can get some glimpses of her cradle. As usual, coming from the hands of the resident woodworker, his artistry knows no bounds. The cradle is made with exotic hardwoods, and so much attention to detail is a bit painful. At least to me, because I feel he always surpasses whatever I can make to compliment his creations. Which in this case, comes to you in the shape of a simple wool-stuffed pillow, a mattress made with cotton ticking (and sponge, to support the heavy baby), and a pre-quilted blanket backed with cotton flannel. Baby Kasja in her bunting sleeper, by Fig and Me. Sweet Baby Kasja, a natural fiber art doll by Fig and me. Eleven inches tall and weighted with glass beads. Kasja is one of those happy-go-lucky babies that don't fuss much and are easily entertained with bubbles or a rattle. She spends a glorious amount of time napping (so jealous!) as she has to concentrate much energy into growing. Given her penchant for the napping-time, I made all her clothes in über soft fabrics. Organic cottons, double-gauzes, cashmere ribbings. Things of that nature. I also aimed to make her clothes with lots of ease so she can move around easily, and not be too fussed about tight clothes. She comes in three full outfits. Her first set consists of a bunting-style sleeper, with long sleeves and a soft velour collar to rub against her sweet cheeks. This set has a knotty hat (which missed the photography session). Kasja's wooden cradle, made of exotic hardwoods and with great care and detail. Baby Kasja comes with a full layette. By Fig and Me. Her second set of clothing is inspired by warm weather and simple lines. I know I mostly make clothes with simplicity of design in mind, but I do like to add little details to bring charm into the dolls' clothing. In this case, she has an A-line dress with cotton lace on the hem. Sleeveless and with a matching set of bloomers. Those bloomers are so ridiculously sweet. Plenty of gathers and puffyness all around. You know me and my hat addiction, so I made her a bonnet. I love babies in bonnets so much, and I actually believe children of this young age benefit from having their little heads covered. Baby Kasja in her cotton double-knit outfit: an A-line dress and puffy bloomers with a matching bonnet. By Fig and Me. Baby Kasja, a baby cloth doll by Fig and Me. And then of course, we made her a more cozy outfit for chilly weather. Some slouchy pants with cashmere ribbing and a comfy kimono-style jacket with satin ties. Of course, a hat had to be made as well. A pointy little toque, that just makes me giggle so much whenever I put it on her. She looks quite content and adorable in all her garments, but the pointy hat wins my heart. Baby Kasja comes with all these clothes, plus her tiny baby bow headband, her diaper, her sweet bib with pompom trim and knitted hat and booties. I am telling you, I had to stop at some point or otherwise I would still be sewing for her. I just find her so endearing, she is such a cute size, and those brown eyes melt me. So there you have it. Kasja is looking for a home today and if you would like to volunteer to take care of her, please enter your details in the form below. Her price is $850 USD plus postage ($30 to the US and Canada. International will need a revised quote). Please only enter if you are personally interested in buying her, not on behalf of someone else. We will receive entries for sweet Kasja until tomorrow February 27th at 7 PM MST, and then we will draw a name at random and proceed to send a Paypal invoice, which is due upon receipt. Baby Kasja has found a home. Thank you so much to everybody that tried welcoming this little baby into your lives. Your letters and notes were very sweet and we feel very blessed you feel such love for the work of our hands. Sweet Baby Kasja, a natural fiber art doll by Fig and Me. So, if you are entering for Baby Kasja, her wardrobe and beautiful cradle, we wish you the best of luck. If you are just coming to say hi, thank you for paying her a visit, but she said to bring baby biscuits next time. Thank you all for your sweetness towards her, we will come back tomorrow to see where Kasja is headed. Exciting times!. Jan 21 Ermentrude, the bookworm. A natural fiber art doll ready to play.